4-Word Review: Playing hooky from school. 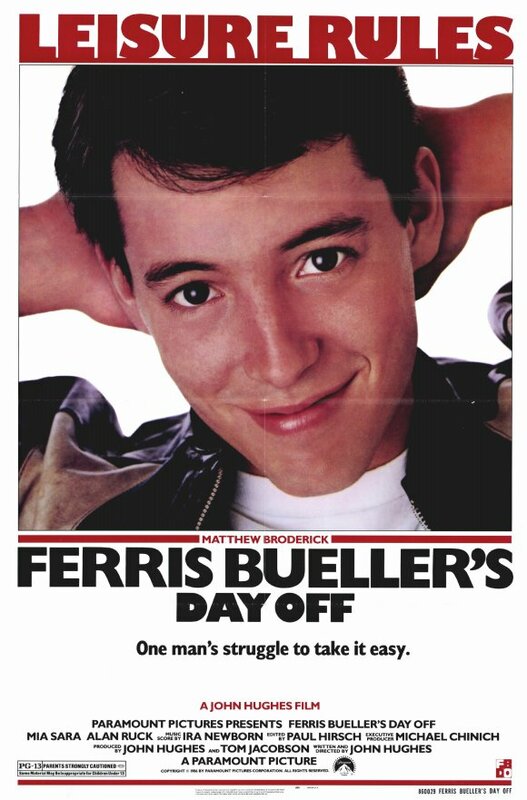 Ferris (Matthew Broderick) is a high school senior who wakes up one nice sunny day in Chicago and decides that he doesn’t want to go to school. He fakes an illness, which his incredibly naïve parents (Lyman Ward, Cindy Pickett) buy into without question even though his sister Jeanie (Jennifer Grey) doesn’t and then gets together with his girlfriend Sloane (Mia Sara) and friend Cameron (Alan Ruck) in Cameron’s Dad’s Ferrari and spends an exciting day in the Windy City where they visit everything from the Chicago Museum to a Cubs ballgame. However, Ed Rooney (Jeffrey Jones) the school’s principal is suspicious about all of Ferris’s chronic absences and is determined to track him down. On a comic level the film has some hilarious and even ingenious bits and in a lot of ways this is John Hughes finest directorial effort simply for the variety of camera angles and humor that is used. My favorite is the scene showing the lost and confused looks of the students faces who are sitting in an economics’ class run by actor Ben Stein lecturing in his patented monotone voice. On the negative end I thought the parents were portrayed as being too stupid and gullible to the point that it became extreme and took away from the humor and Ferris’s perceived cleverness since the average 3-year-old would be able to dupe these morons. The symptoms he complains about clearly sound dubious and if anything they should have made an appointment for him to see a Dr. that day. You would also think that these idiot’s would get a hint that he was faking it since this was already the 9TH time this semester he had called in. How much more of a wake-up call do they need? Weren’t they teenagers once as well and didn’t they try to fake illness too to get out of school and shouldn’t they in the back of their minds presume that their kids might try to do the same? The Ferris character is a bit too cocky and in some ways I sided with his sister as well as Rooney in giving this smug kid of bit of a comeuppance. The character borders on being one of these entitled teens who thinks he will be able to cheat the system his whole life and then when he gets out into the world and has to work a real job and play within the rules he and others like him can’t handle it or worse end up getting fired or sent to jail because they expect to still be able to cut-corners and get away with it. The humor, especially during the second-half gets rather implausible. One scene has the Dad reading a newspaper with an article about a community rallying around a sick teenager (Ferris), but Ferris had only called in sick that morning, which was well after the paper had gone to press and there were no evening newspapers in Chicago at that time. The scene where Ferris and Cameron hide in the backseat of a car when their cab gets parked right next to his Dad’s and all his dad sees is Sloane who he doesn’t recognize didn’t make sense either. I suppose it was possible that the Dad had never met her, but Ferris seemed to have been seeing her for quite a while and was even proposing marriage to her, which made me feel that he had most likely brought her home already for his Mom and Dad to meet. Also, why can’t Jeanie recognize Mr. Rooney when she comes upon him inside her house and karate kicks him straight in his face? The scene where they put the Ferrari on a jack and then a cement block on the accelerator and drive it in reverse in an effort to take off the miles, so Cameron’s Dad wouldn’t find out they had driven it, seems implausible as well. This is mainly because it gets done inside a glass garage. I realize that the garage door was open, but the back of the car was facing the enclosed glass wall, which would have trapped the exhaust fumes and made it impossible for them to stand there and have the long conversation that they do without choking and having their eyes get all watery and itchy. The side story involving Cameron’s issue with his father who seems to love his car more than his own son doesn’t work mainly because it’s hard to go from zany comedy to drama especially in this case when it’s all rather pseudo-psychological. It’s also frustrating to spend as much time talking about it as they do, but never actually see the father nor the final meeting that he has with Cameron, which could have been revealing and insightful. The film still has its moments and I loved it as a teen, but now it seems lodged in a more innocent era were adolescent hijinks was considered ‘good innocent fun’ without even slightly balancing it with the darker and serious consequences that can come about from teenagers who think that they can get away with anything. The filmmakers themselves prove my own point and what a thin line this type of plot walked because originally there was a scene were Ferris steals some bonds from a shoebox in his father’s closet and then cashes it in a bank and uses the money to fund his day on the town, but the scene was later deleted because it was felt it made him seem too much like a thief instead of a ‘lovable rogue’. This entry was posted in 80's Movies, Adolescence/High School, Classic, Farce, Movies that take place in Chicago and tagged Alan Ruck, Ben Stein, Entertainment, Jeffrey Jones, Jennifer Grey, John Hughes, Matthew Broderick, Movies, Review. Bookmark the permalink. 5 out of 10 for Ferris Bueller!?! You’re breaking my heart here, Richard. BTW I grew up in the Chicago suburbs and if I remember correctly our local suburban paper was an evening paper. So they did still exist here and there. I lived in Chicago for 18 years as well. I know the local suburban paper was The Daily Herald, which I know was a morning paper. Either way the father is reading the newspaper in downtown Chicago while sitting in a cab, so the presumption would be it was probably the Chicago Tribune, which is also a morning paper. Actually, before The Daily Herald took over many of the smaller suburban papers…in Wheaton we had The Daily Journal, which arrived at our house at about 4 every afternoon. But yes, he is downtown and likely not reading a smaller paper. What are you smoking Richard! Are you in California? LOL!! It’s okay, we still love ya even though you bashed Ferris! After reading your review I don’t think I’ll be in a hurry to watch Ferris Bueller again.